This chettinad style chicken biryani comes close to the Thalapakatti style biryani in terms of flavour and taste. The freshly roasted and ground masala powder adds wonderful aroma and beautiful flavour to the biryani. The core of this biryani is this masala powder. It is a heady masala combination which just cannot fail – hot, aromatic and lip-smacking. Red chillies, whole black peppercorns, fennel, cumin, cardamom and cinnamon – you could try using this masala powder for your chicken gravies and kormas and I’ll tell you it is absolutely fantastic. Serve this biryani with chilled raita and boiled eggs for a perfect weekend meal. My husband a very picky eater gave the thumbs up to this biryani and my dad, a very conservative eater (he hates experimentation) finished off the biryani in no time, which all means it really is good. I was worried I had made too much biryani and that I’d have to do the refrigerate-reheat-refrigerate routine the next day but guess what, there was no biryani left over. If every family had to have a family dish (like a family song), biryani would be our family dish. Dosai would also be a strong competitor though. Biryani defines our family – grandiose, masala rich and extra large. Red chilli powder – 1 heaped tbsp. 1. Wash and clean the chicken and cut into fairly large pieces. Marinate the chicken pieces with the ingredients called for under marinade for 20 minutes or more. 2. Rinse Basmati rice/long grain rice in 2-3 changes of water till the water runs clear. Soak basmati rice in water for 1 hour or more. 3. Dry roast the ingredients called for under “Dry masala powder” till fragrant and the coriander seeds start colouring – about 3-4 minutes on low heat. Then powder the dry roasted ingredients in a mixer grinder without adding any water. Set aside. 4. In a pressure cooker, pour in 3tbsp oil and 2 tbsp oil and when hot, drop the fennel seeds. Let fry till fragrant. Then throw in the cinnamon, cloves, Marathi moggu and kalpaasi and stir around. Let fry till fragrant. 5. Pour in the curd and stir. Let cook till the water has evaporated and it’s quite thick about 2 minutes. 6. Add the remaining ginger-garlic-coriander paste and fry till it starts browning. Keep stirring and scraping to prevent the masala from burning. 7. Throw in the chopped onions and sauté till translucent. Add the tomatoes, mix and let fry till cooked through and soft. 8. Add the marinated chicken along with the marinade, turmeric powder, red chilli powder, freshly ground dry masala powder and salt. Mix well. Cover with a lid and let the chicken cook for about 10-15 minutes on low. Cook on low till the mixture attains a gravy consistency, the oil separates and the chicken is cooked through. Open and stir periodically. 9. Drain the water and tip in the rice. Drop in the green chillies. Mix gently and level the rice mixture. Add enough water to cover the rice. Use your index finger to measure the water level above the rice mixture. It should be just a little above the first line on your index finger (halfway between the first and second line on your index finger). 10. Taste the water and adjust salt. Close and pressure cook on low for 10-12 minutes. Switch off. 11. Let the steam escape. Open and drizzle 1 tbsp ghee all over and around the edges. Use a fork to gently fluff up the rice so that it doesn’t lump up as it cools down. Close with pressure cooker lid to keep hot. 12. Serve hot with Onion raita (Onion Pachadi) and boiled eggs. Here’s a compilation of our family favourite non-vegetarian dishes. 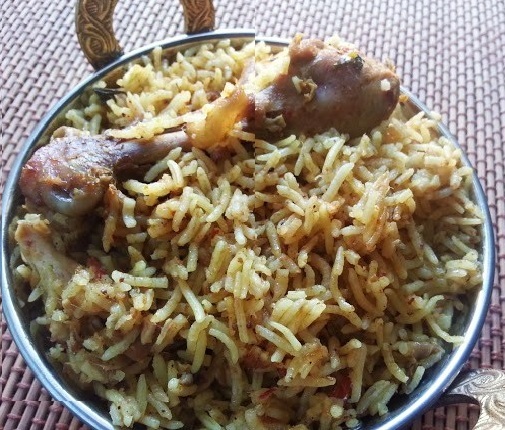 This entry was posted in Chicken, Fish & Meat, One-pot dishes, Rice & Biryani and tagged chettinad masala, chettinad style chicken biryani, chicken, chicken biryani, main dish, non-vegetarian, recipe, rice, rice dish, thalapakatti style biryani.